This article is about the 1966 film. For other uses, see Born Free (disambiguation). When George Adamson is forced to kill a lion, after the lion scares a native villager, and then George kills a lioness out of self-defense, he brings home the three orphaned cubs she had been trying to protect. The Adamsons tend to the three orphaned lion cubs to young lionhood, and, when the time comes, the two largest are sent to the Rotterdam Zoo, while Elsa the Lioness (the smallest of the litter) remains with Joy. When Elsa is held responsible for stampeding a herd of elephants through a village, John Kendall, Adamson's boss gives the couple three months to either rehabilitate Elsa to the wild, or send her to a zoo. Joy opposes sending Elsa to a zoo, and spends much time attempting to re-introduce Elsa to the life of a wild lion in a distant reserve. At last, Joy succeeds, and with mixed feelings and a breaking heart, she returns her friend to the wild. The Adamsons then depart for their home in England; a year later, they return to Kenya for a week, hoping to find Elsa. They do, and happily discover she hasn't forgotten them, and is the mother of three cubs. The Adamsons, made an agreement not to handle the cubs, as they did for Elsa. The film also credits lions and lionesses Boy, Girl, Henrietta, Mara, Ugas, and "the Cubs". George Adamson served as chief technical advisor on the film and discusses his involvement in his first autobiography, Bwana Game (UK title, 1968), known in the US as A Lifetime with Lions. According to Ben Mankiewicz, who introduces the film on Turner Classic Movies, they used mostly wild lions and interviewed over 3000. The making of the film was a life-changing experience for actors Virginia McKenna and her husband Bill Travers, who became animal rights activists and were instrumental in creating the Born Free Foundation. One of the lions in the film was played by a former mascot of the Scots Guards, who had to leave him behind when they left Kenya. The producers also acknowledged the help received from Emperor Haile Selassie of Ethiopia and the Game Department of Uganda. Born Free received critical acclaim. Review aggregator Rotten Tomatoes reports that 92% of 12 film critics have given the film a positive review, with a rating average of 7 out of 10. Vincent Canby waxed enthusiastic about the film, writing in The New York Times, "Almost from the opening shot – a vast expanse of corn-colored African plain where lions feed on the carcass of a freshly killed zebra – one knows that Joy Adamson's best-selling book Born Free has been entrusted to honest, intelligent filmmakers. Without minimizing the facts of animal life or overly sentimentalizing them, this film casts an enchantment that is just about irresistible." Dave Kehr of the Chicago Reader wrote, "John Barry's schmaltzy title song is still haunting the elevators and supermarkets, but this is really a nicely restrained children's tearjerker that doesn't overdo the anthropomorphism, despite extreme provocation." Academy Award for Best Song: John Barry (music) and Don Black (lyrics) for "Born Free"
The book Born Free (1960) was followed by two other books, Living Free (1961) and Forever Free (1963). In 1972, a film sequel entitled Living Free was released. While deriving its name from the second book, the film was based on the third book in the series. It starred Susan Hampshire and Nigel Davenport as Joy and George Adamson. A documentary follow-up to Born Free, entitled The Lions are Free, was released in 1969. 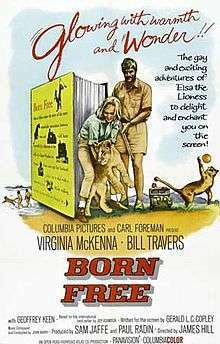 The film follows Born Free-actor Bill Travers as he journeys to a remote area in Kenya to visit George Adamson, and several of Adamson's lion friends. In 1974, a thirteen-episode American television series was broadcast by NBC, entitled Born Free, starring Diana Muldaur and Gary Collins as Joy and George Adamson. The series was later followed by television film in 1996 called Born Free: A New Adventure, with Linda Purl and Chris Noth. Joy and George Adamson do not appear as the main characters in the story. To Walk with Lions (1999) depicts the last years of George Adamson's life, as seen through the eyes of his assistant, Tony Fitzjohn. George is portrayed by Richard Harris, and Honor Blackman makes a brief appearance as Joy. The one-hour Nature documentary Elsa's Legacy: The Born Free Story was released on PBS stations in January 2011. It includes a collection of archival footage and an exploration into the lives of Joy and George Adamson during the years following release of the film. Season 1 episode 15 of The Carol Burnett Show featured a comedy skit that parodied Born Free. It aired 1 January 1968 and starred Carol Burnett, Harvey Korman, and Tim Conway. Season 5 episode 6, "Far Away Places", of the AMC period drama Mad Men has the character of Peggy Olson skip work to catch a matinee of Born Free. In the 1975 movie Shampoo, the Jack Warden character Lester sings a snippet of the song to himself. In the opening scene of the 2005 animated film Madagascar, Marty the Zebra has a dream sequence of running through the African savanna with the song in the background. In the 2012 video game Silent Hill: Downpour, the song from the movie is played numerous times throughout the game. The main theme from Born Free recurs throughout the later series of the popular American drama series Dexter. ↑ LIFE – Google Books. Books.google.com.au. 28 November 1969. Retrieved 2012-01-04. ↑ "Most popular star for third time." Times [London, England] 31 Dec. 1966: 5. The Times Digital Archive. Web. 16 Sept. 2013. ↑ "Born Free". Flixster. Rotten Tomatoes. Retrieved 18 December 2012. ↑ Canby, Vincent (23 June 1966). "The Screen: Honesty and Humor Make 'Born Free' a Fresh and Moving Film:Biography of Lion Has Documentary Flavor". The New York Times. Retrieved 18 December 2012. ↑ Kehr, Dave. "Born Free". Chicago Reader. Retrieved 18 December 2012. ↑ "AFI's 100 Years...100 Songs Nominees" (PDF). Retrieved 2016-08-06. ↑ Ray, Rachel (7 January 2011). "Elsa's Legacy: The Born Free Story, Nature on PBS – US TV review". The Daily Telegraph. Retrieved 18 December 2012. George Adamson information website with photos, letters and much information and featuring Elsa the Lioness. Tribute to Elsa the Lioness of Born Free.